Here’s a very weird — but completely true! -- fact…. 99% of people can’t lick their elbows — but 90% of people who read this will try! 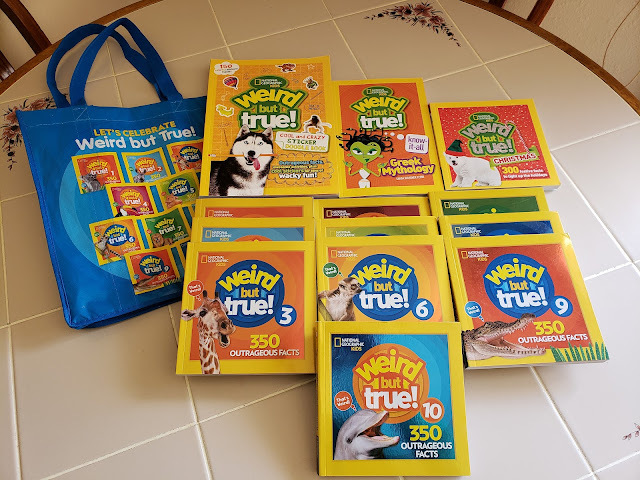 Entertaining and brain bending facts like that, coupled with visually stunning and eye popping photos and graphics, are the reason why the 35+ titles in the National Geographic Kids Weird But True! book franchise are considered the gold standard in educational, entertaining books for kids. With over 5 million copies sold, published in over 15 different languages, and featuring a broad range of topics from science to food to pop culture, Weird But True! books nab kids’ attention and get them reading. Now, with the release of the 10th book in the Weird But True! main series, things just got WEIRDER and it’s time to celebrate! It is my pleasure to offer you a chance to win a National Geographic Kids Weird But True! Mega Prize Pack which consists of a total of THIRTEEN books and a tote bag (ARV $130): Weird But True! books 1-10; Weird But True! Know-It-All Greek Mythology; Weird But True! Cool and Crazy Sticker Doodle Book; Weird But True! Christmas and a handy Weird But True! bag to carry groceries, toys, or this big haul of books! 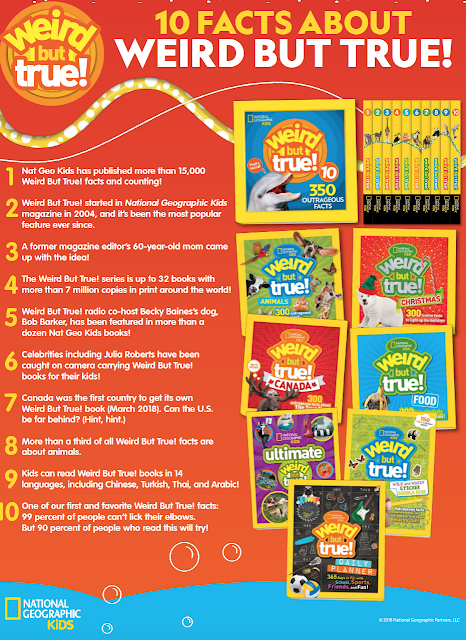 One lucky winner will receive a National Geographic Kids Weird But True! Mega Prize Pack which consists of a total of THIRTEEN books and a tote bag (ARV $130): Weird But True! books 1-10; Weird But True! Know-It-All Greek Mythology; Weird But True! Cool and Crazy Sticker Doodle Book; Weird But True! Christmas and a handy Weird But True! bag to carry groceries, toys, or this big haul of books! The winner must have a U.S. shipping address. No P.O. boxes. The winner must reply to our email with their shipping address within 48 hours. Otherwise, we will select a new winner. Good luck! Check out the National Geographic Kids Weird But True! Website. Watch the Emmy nominated Weird But True TV on Fox’s Xploration Station Here. Listen to the Weird But True Radio on Sirius XM Kids' Place Live Here. Check out videos galore at National Geographic Kids Weird But True! Youtube Channel Here. There’s a (Weird But True!) app for that Here. Enter the Weird But True! USA contest: Share your wacky fact about your town or state Here. Follow on social media: Facebook and Twitter! Disclosure: Susie's Reviews receives compensation for the posts on this site from brands or products. Our opinions are honest and our own.